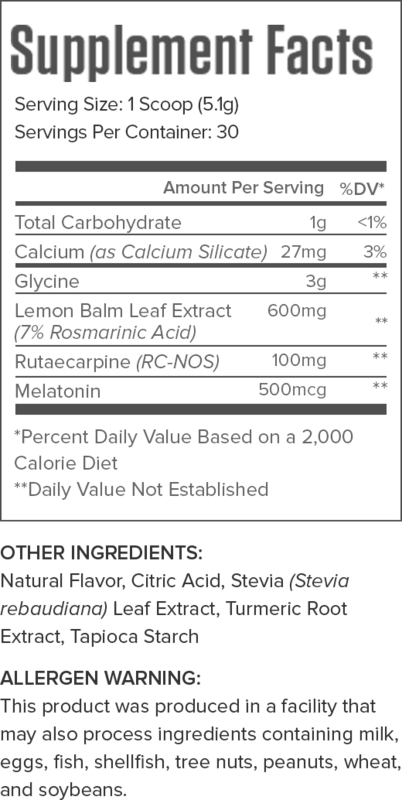 Together, the clinically effective dosages of glycine, lemon balm extract, and melatonin reduce the amount of time it takes to fall asleep, improve sleep quality, and reduce feelings of anxiety and stress, and the rutaecarpine counteracts the effects of caffeine, which remains in the body for much longer than many people realize and can greatly interfere with sleep. LUNAR is also naturally sweetened and flavored and contains no artificial food dyes, fillers, or other unnecessary junk. All that is why it has over 180 reviews from customers on Amazon.com with a 4-star average, and another 110+ on our websites, also with a 4-star average. What LUNAR is not, though, is cheap, so if you’re concerned about the price, I understand--you can get a sleep supplement for a bit less. Remember that you get what you pay for, though, so generally speaking, the cheaper a supplement is, the less effective the formulation. Place your order now and if you don’t absolutely love LUNAR, just let us know and we’ll give you a full refund on the spot. No complicated forms and no return necessary. You really can’t lose, so order now and get ready to enjoy deeper and more restful sleep, and to wake up feeling more energized and refreshed. Glycine is an amino acid and neurotransmitter found mainly in foods that contain gelatin, like meat and various types of seafood. Melatonin is a hormone produced by the brain that regulates sleep. It’s also found in foods like tomatoes, walnuts, strawberries, and olive oil. Although melatonin is a “go-to” supplement for improving sleep quality, and it can help in this regard, maintaining proper sleep cycles is more important. No amount of melatonin supplementation can compensate for what you lose through poor sleep hygiene. The clinically effective dosage of melatonin ranges between 500 micrograms and 5 milligrams. We chose the low end of the clinically effective dosage range because research shows that the benefits of melatonin aren’t dose dependent. That is, taking more will not help you fall asleep faster. Lemon balm (Melissa officinalis) is an herb that has been used medicinally since ancient Greek times to relieve anxiety and agitation and promote sleep. The clinically effective dosage of lemon balm ranges between 300 and 1,200 milligrams. Rutaecarpine is a molecule found in the Evodia rutaecarpa plant, which produces berries that have been used in Traditional Chinese Medicine to raise body temperature and reduce pain and gastrointestinal distress. 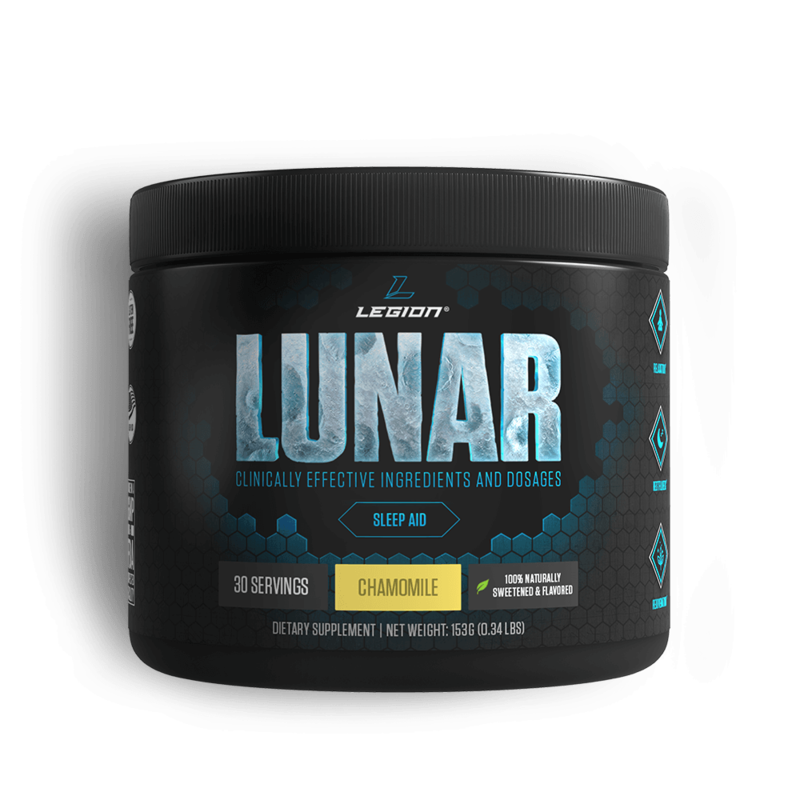 We chose to include this in LUNAR because it helps address a common problem that athletes and gymgoers run into: ingesting caffeine before late-day workouts can disrupt sleep. This means that many people who exercise later in the day simply can’t have caffeine, which isn’t ideal for maximizing performance and results. 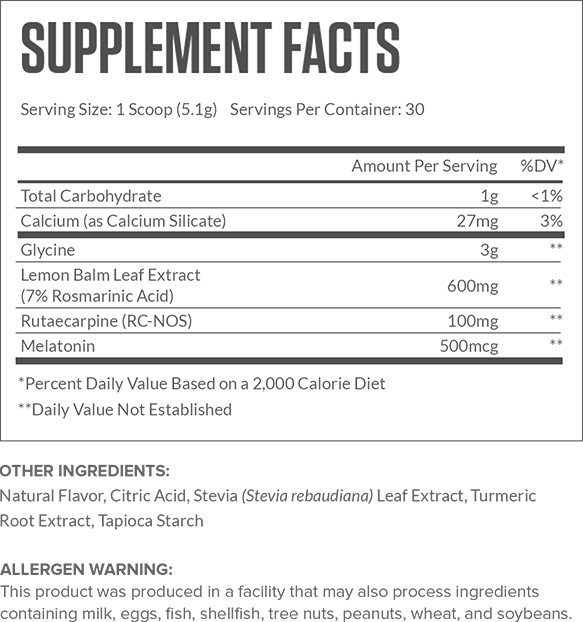 Rutaecarpine helps mitigate this drawback by eliminating caffeine from the body, allowing for both pre-workout caffeine consumption and restful sleep. Clinically effective dosages of rutaecarpine haven't been well established yet, but anecdotal evidence has shown that 100 milligrams is effective for negating caffeine. Mix 1 scoop with 8-10 oz of water or your preferred beverage 30-45 minutes before bed. Lunar can be used daily without harm, but by using it less frequently, you will maximize its effectiveness. We recommend that you use Lunar up to three times per week on nights where good sleep is particularly important. May cause drowsiness, be careful when driving a motor vehicle or operating machinery. Check with a qualified healthcare professional before using this product if you are under 18 years of age or if you have any pre-existing medical conditions and/or are taking any prescription medication(s). 06. Effect of 1 week of sleep restriction on testosterone levels in young healthy men. 15. Human longevity is associated with regular sleep patterns, maintenance of slow wave sleep, and favorable lipid profile. 26. The effects of glycine on subjective daytime performance in partially sleep-restricted healthy volunteers. 50. Splenda alters gut microflora and increases intestinal p-glycoprotein and cytochrome p-450 in male rats. 51. What made Canada become a country with the highest incidence of inflammatory bowel disease: could sucralose be the culprit? 52. Consumption of artificial sweetener- and sugar-containing soda and risk of lymphoma and leukemia in men and women. 53. Fueling the obesity epidemic? Artificially sweetened beverage use and long-term weight gain. 54. Artificial sweetener use among children: epidemiology, recommendations, metabolic outcomes, and future directions. 55. Gain weight by “going diet?” Artificial sweeteners and the neurobiology of sugar cravings. 56. Steviol glycosides from Stevia: biosynthesis pathway review and their application in foods and medicine. 57. Antioxidant, anti-diabetic and renal protective properties of Stevia rebaudiana. 58. Safety evaluation of certain food additives. 59. Effects of Stevia rebaudiana (Bertoni) extract and N-nitro-L-arginine on renal function and ultrastructure of kidney cells in experimental type 2 Diabetes. 60. Toxicological significance of azo dye metabolism by human intestinal microbiota. 61. Effects of tartrazine on exploratory behavior in a three-generation toxicity study in mice. 62. Artificial food dyes and attention deficit hyperactivity disorder. 63. Meta-analysis of attention-deficit/hyperactivity disorder or attention-deficit/hyperactivity disorder symptoms, restriction diet, and synthetic food color additives. 64. Food additives and hyperactive behaviour in 3-year-old and 8/9-year-old children in the community: a randomised, double-blinded, placebo-controlled trial. 65. Prolonged use of the food dye tartrazine (FD&C yellow no 5) and its effects on the gastric mucosa of Wistar rats. 66. Effect of food azo dye tartrazine on learning and memory functions in mice and rats, and the possible mechanisms involved. 67. Effect of food azo dyes tartrazine and carmoisine on biochemical parameters related to renal, hepatic function and oxidative stress biomarkers in young male rats. 68. Physiological effects of some synthetic food colouring additives on rats. 69. New considerations regarding the risk assessment on Tartrazine An update toxicological assessment, intolerance reactions and maximum theoretical daily intake in France.